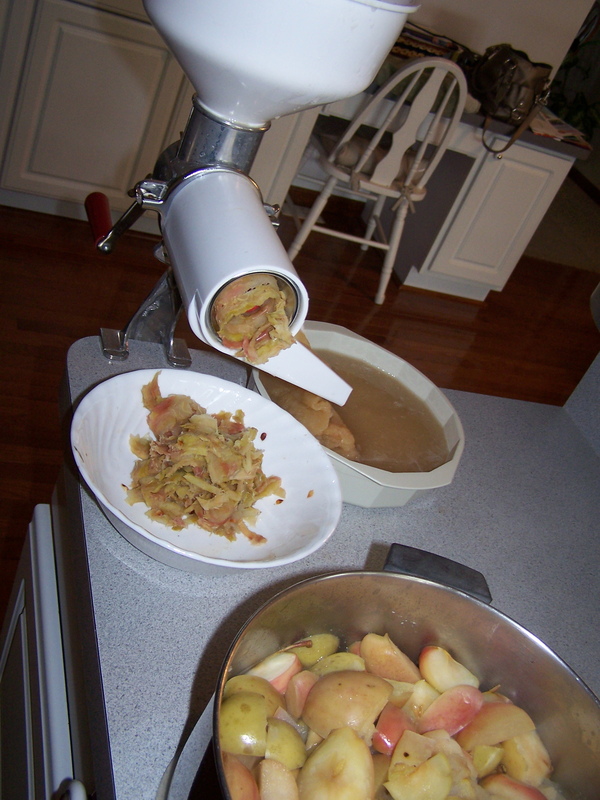 I hurt my right arm this summer; probably a combination of age and over-use from a heavy week of chopping and cranking three bushels of apples into sauce. The sling is gone, but I still wear a brace to support the tendon. And, while it still hurts, it isn’t waking me up at night anymore. Not being able to do things is driving me up the wall. 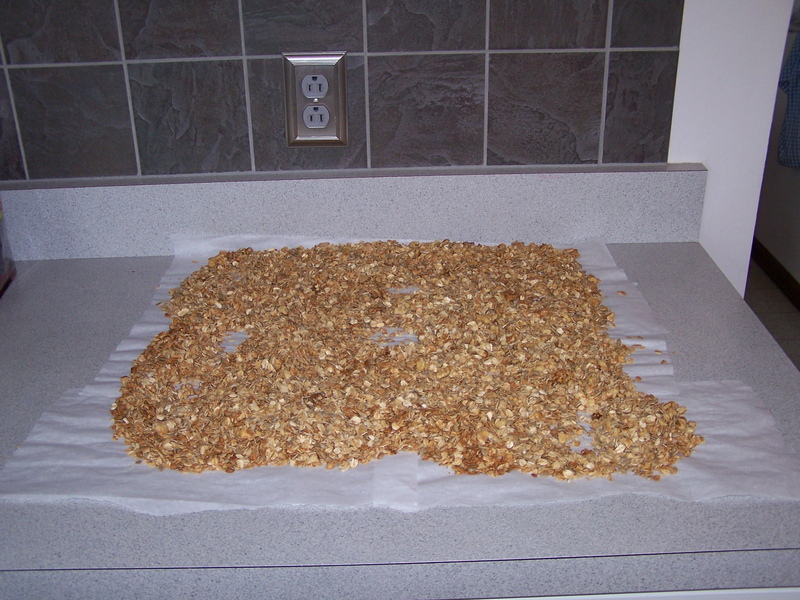 Because of the physical limitations from being “one-handed,” my normal cooking activity has been greatly curtailed. 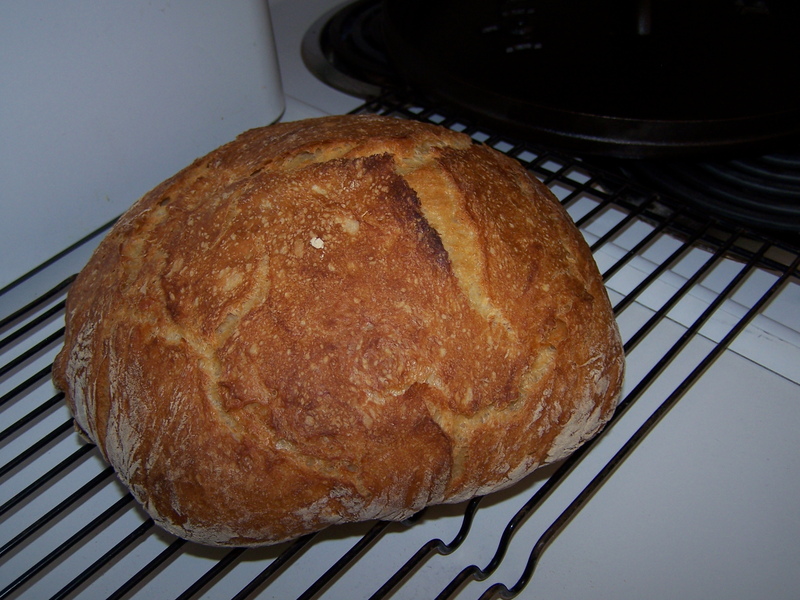 However, I discovered a recipe for No Knead Bread that is amazing! You don’t need two totally functioning hands to make this! The recipe is simple! 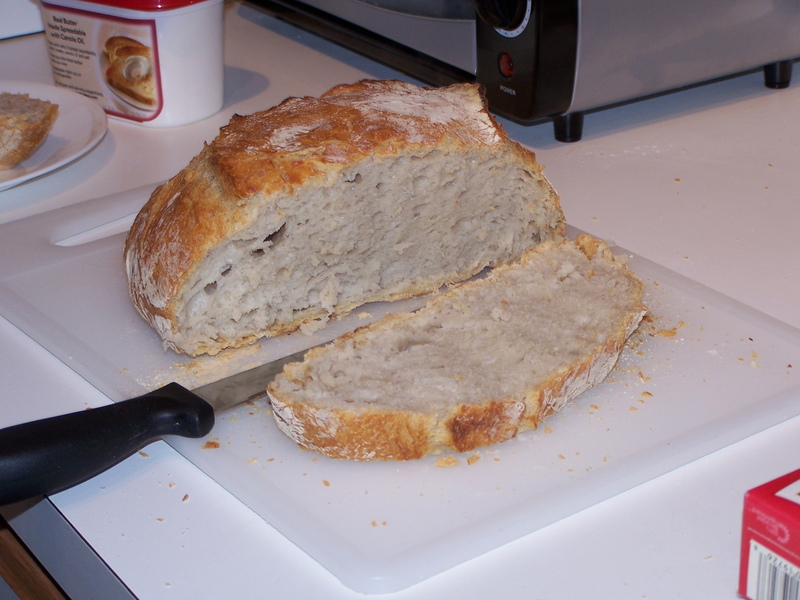 Three cups of regular white flour, one teaspoon of salt, 2 1/4 teaspoon of rapid rise yeast, and 1 1/2 cups of warm water. Mix it up in a bowl, cover with plastic and put in a warm place for a couple of hours to rise. The flour, water, and yeast mix ready to turn into sponge. 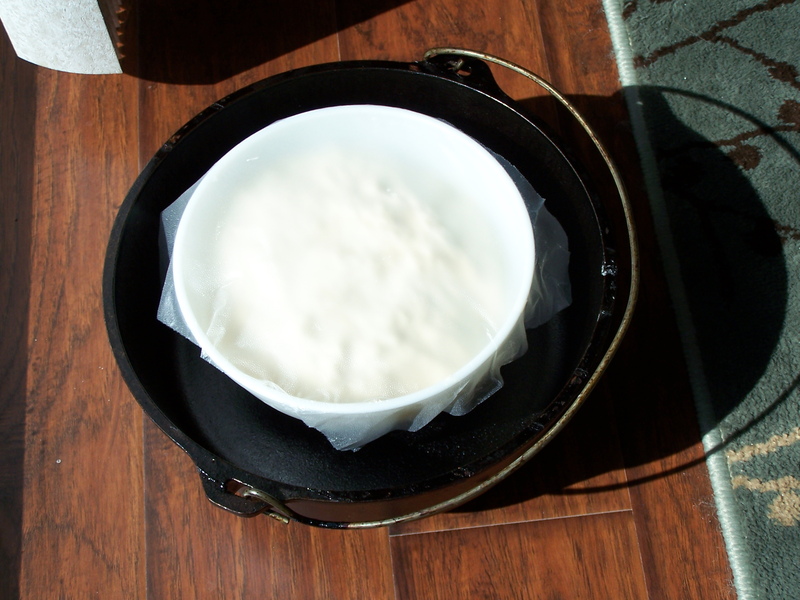 I covered the bowl of dough with a piece of plastic wrap, placed it inside my Dutch Oven, and set it in a sunny spot in my kitchen. The sunshine streaming through the window made free heat for my dough. After two hours, the dough had risen to the top of the bowl and was ready for the next step. I dumped the sticky sponge onto a flour-covered cutting board, rolled it around and shaped it into a ball for the second rising. This sat on my counter for a half hour. 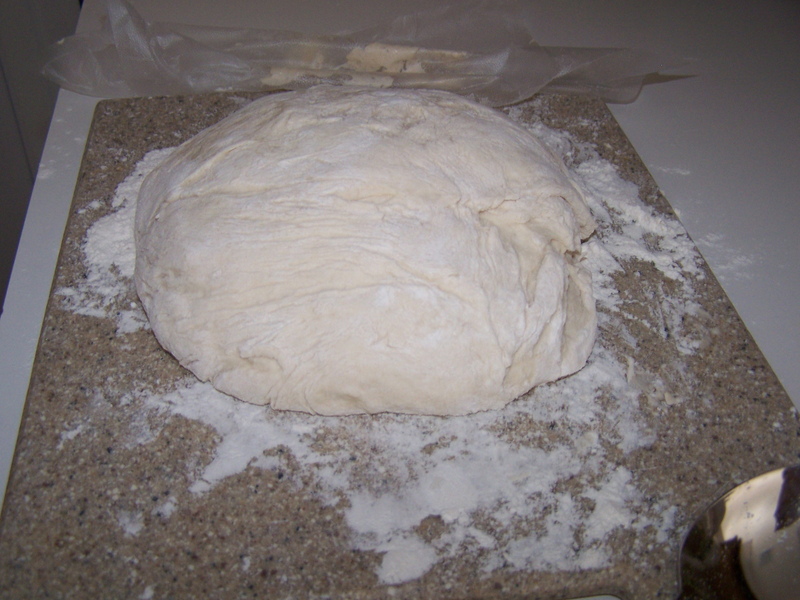 Dough ready to rise again. While the dough was rising I preheated the oven to 450 degrees. The Dutch Oven and lid went inside the oven to heat for a full thirty minutes. The dough was then placed inside the hot Dutch Oven and covered for thirty minutes of baking; I removed the lid and baked it uncovered for an additional fifteen minutes. The bread slid easily from the pan onto the cooling rack. It has a crunchy crust and tastes like fancy artisan bread from five-star restaurants. 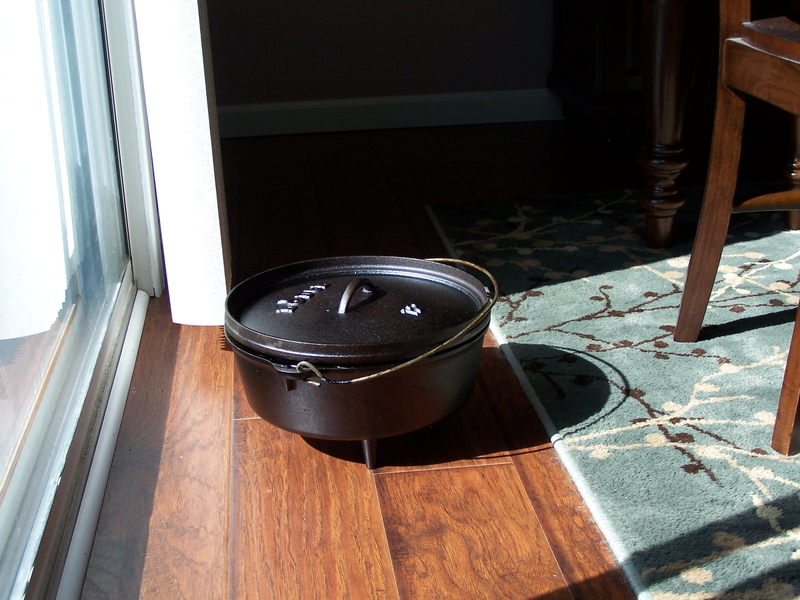 The Dutch Oven acts much as an old-fashioned clay oven. The prettiest (and easiest) bread I have ever made. We could hardly wait to cut and sample it. It tasted great with homemade strawberry jam and I am already planning different combinations of spices and flours for future experiments. I encourage you to give this a try. If you come up with any winning combinations of flours and spices, please post them in comments. We had lots of company over the Labor Day weekend, which meant preparing lots of meals! I enjoy cooking so that was not a problem, but never know how much to prepare, with people popping in and out and never wanting to end up short on food. I would much rather have more food than I need on hand than to run short. One of our planned lunches was burgers on the grill and we loaded up on fresh ground beef, conveniently on sale at the local supermarket. I commented to my husband that my pantry supply of canned ground beef was running low and how I half wished I had time to process some at such a great price. (Canned burger in the pantry? You betcha!) After the weekend I was left with about 8 pounds of extra meat which I processed on Tuesday. It is so easy to produce this great convenience food if you own a pressure canner. 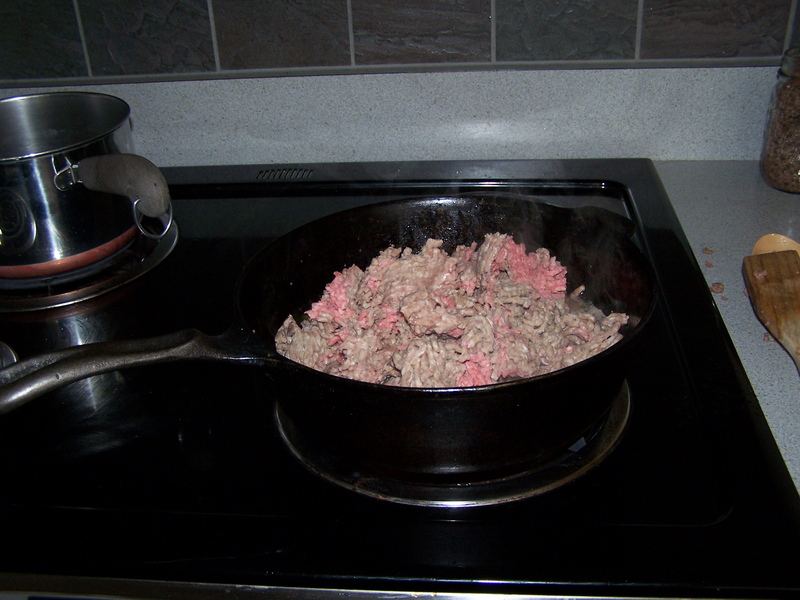 Frying up the beef. 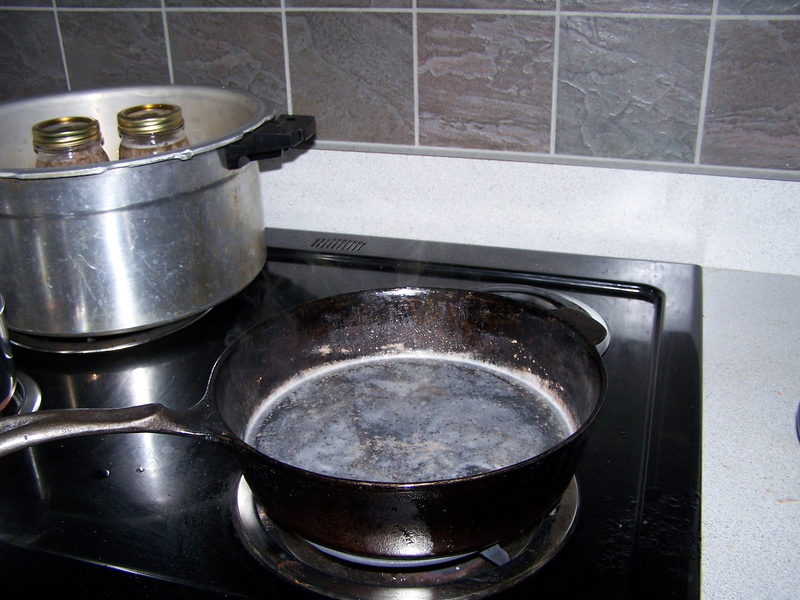 I love my black iron pans! It isn’t a good idea to can raw ground beef because the product is too dense to heat properly, and you would end up with a sort of meatloaf-y lump. 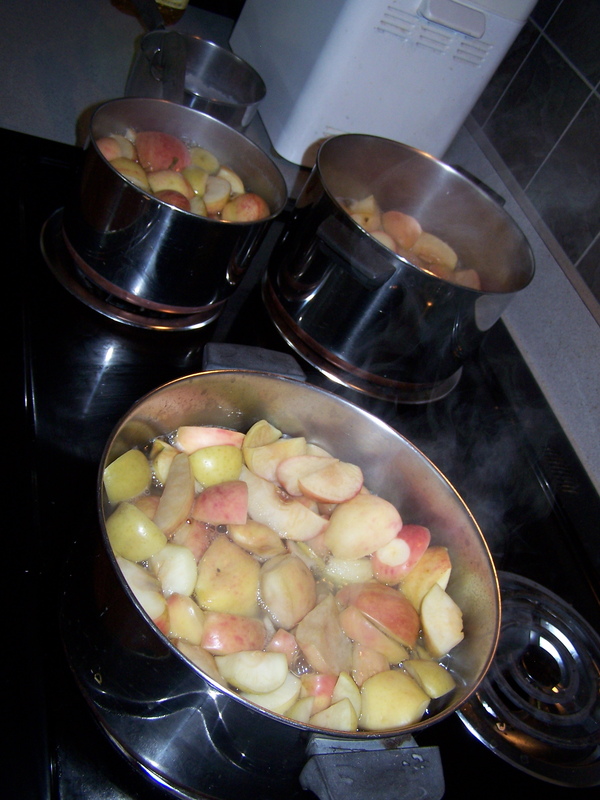 Fry it up till the pink just disappears; it will continue to cook during the canning process. Loading the hot jars with yummy burger. Strain the burger from the grease and spoon into hot jars to @ one inch from the top. I like to add 1/2 tsp of canning salt to each jar for taste. It isn’t necessary to add salt if you are on a sodium diet. The jars of burger will still process just fine. Drain the fat from the cooking pan,add water to the pan drippings, and bring this “juice” to a boil. Ladle this flavorful mixture into the jars of meat to @ 1 inch from the top of the jar. Release air bubbles, wipe the lip of the jars with a clean, wet paper towel to remove any grease, and seal with a new, simmered jar lid. 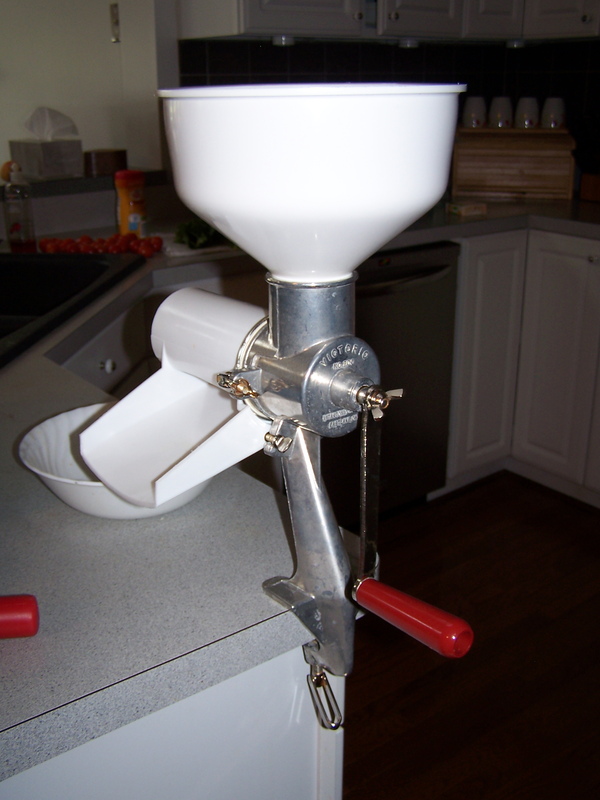 Add hand-tightened rings to hold the lid in place and process in your canner. Process pints for 75 minutes at 10 pounds of pressure and quarts for 90 minutes. Remove from heat and allow the canner’s pressure to drop naturally before opening. This usually takes about 45 minutes. Shelf stable burger ready for the pantry. 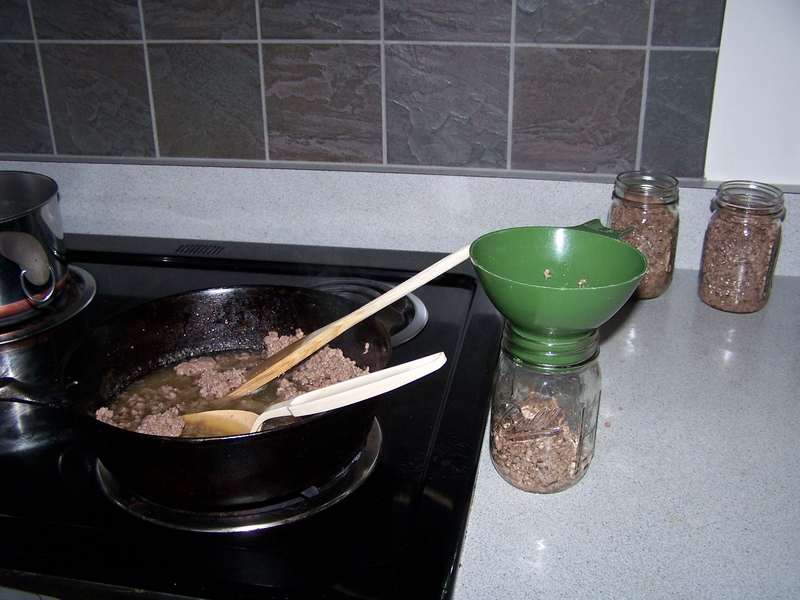 Carefully remove the hot jars of meat from the canner and place on a folded towel away from drafts. In a short time you should hear the “pings” of sealing lids. Allow the jars to sit undisturbed overnight, remove the rings, wash in hot, soapy water, and label. 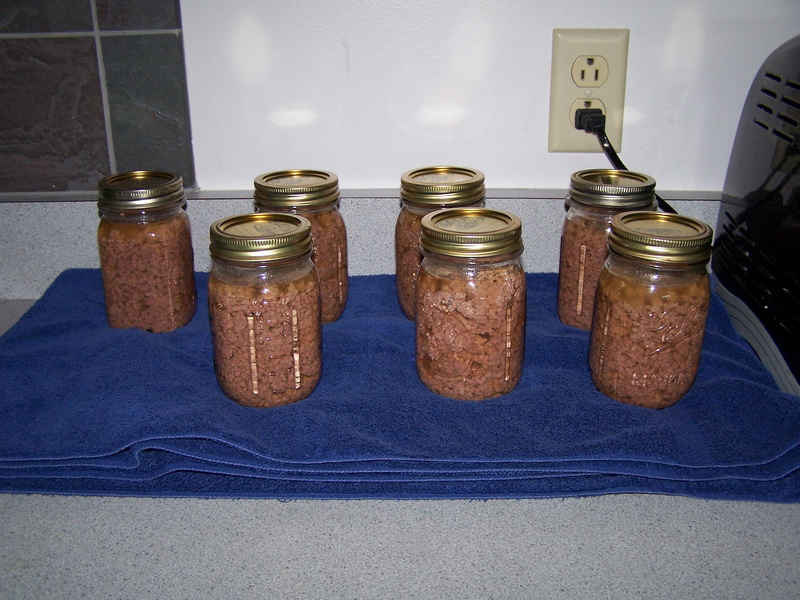 Your jars of burger are now shelf-stable and are safe to use as long as the lid remains sealed. To use, open and dump into a pan and heat to a boil for 15 minutes and use as a meat base for goulash, Spanish rice, chili, soups, or gravy. Canning burger allows you to take advantage of left-over meat, or cash in on grocery store sales without worrying about freezer space or power outages. It is an old-fashioned convenience food for fast and easy meal preparation! This was supposed to be a food-production summer! 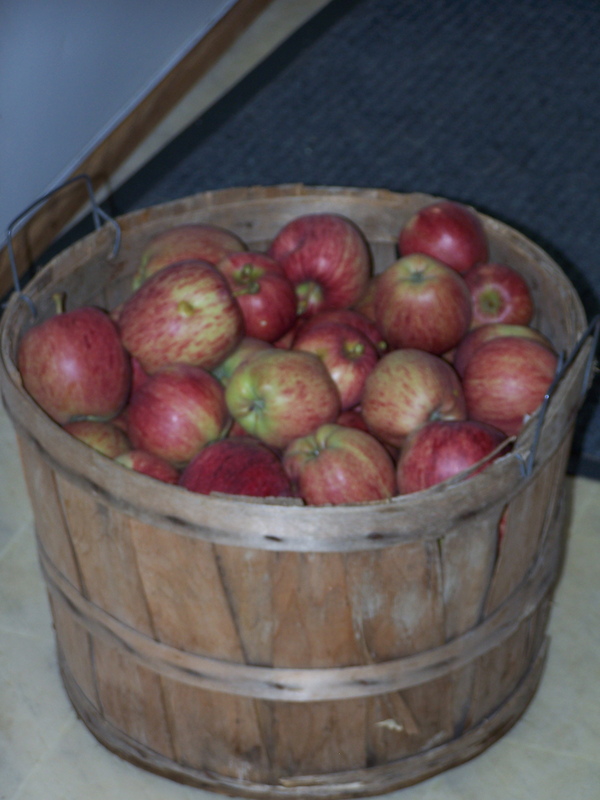 Our intention was to intensely garden and preserve most of the harvest in glass canning jars to enjoy all winter long. 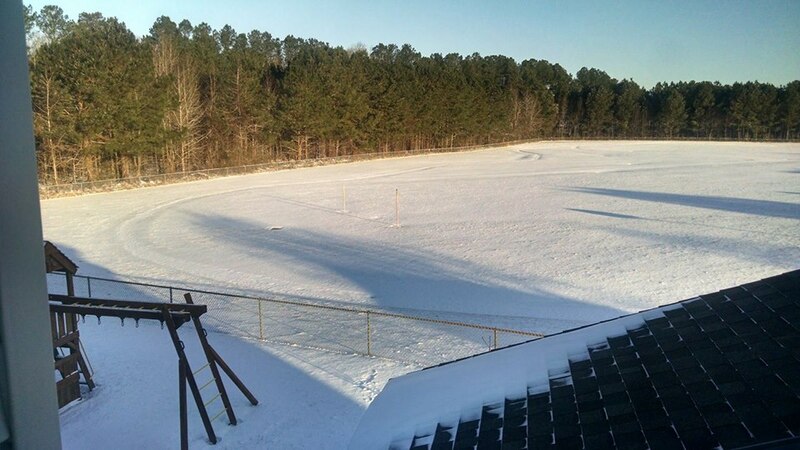 Unfortunately, our heavy clay soil, colder than normal temperatures, and the heavy, frequent rains are a poor combination for growing much of anything. Our corn is only waist high and has tasseled out without any ears to pollinate and the green beans drowned out twice. Fortunately we have a few raised beds with decent drainage and they are producing fairly well. I have a “Ratatouille Garden.” Meaning, most of what I planted in the raised beds will grow into the ingredients of one of my favorite foods, the humble eggplant stew made famous by the Disney movie about a cooking rat! I don’t make mine in the stylized, stacked strata of the animated film. My version of Ratatouille is scooped, steaming out of the pot, and served with a chunk of crusty, homemade bread on the side. Everyone who makes this has their own version of the dish, probably because we tend to “make it up as we go along” depending on whatever is ripening in the garden. I make a base of garlic, chopped onions and chopped green or red (or both if I have them) peppers, sautéed until tender in olive oil. Next I add peeled, chopped eggplant and cook that for a bit with the base. I add several cans of Italian Seasoned chopped tomatoes (if I don’t use my own spices and home canned tomatoes or have enough fresh from the garden). Then I throw in chopped zucchini and yellow summer squash. Add Italian seasonings to taste. I don’t measure, and just “eyeball” the quantities, depending on what I have on hand. I bring it to a boil for @15 minutes to blend the flavors and then ladle into hot canning jars and process in my pressure canner. The veggies are still a little under-done at this stage but will finish cooking in the canner. I set the regulator at 10 pounds of pressure and let it rock for 50 minutes because I preserve this summer goodness in quart jars. 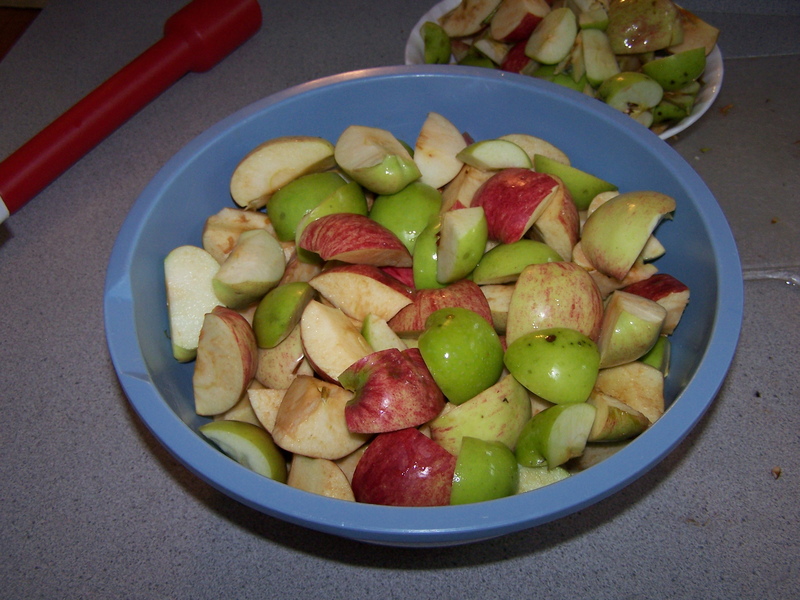 Follow the directions for normal pressure canning of low-acid foods. Boil contents 20 minutes before serving. This is an extremely yummy, low calorie, low weight-watcher point meal before you add the bread! I love Ratatouille and think I could live on this stuff. 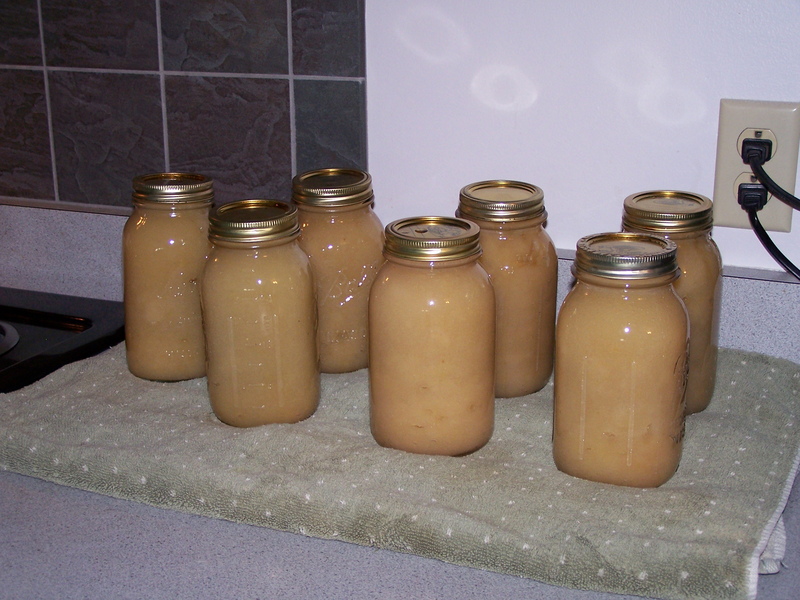 Thanks to pressure canning, I have captured summer goodness in the can to enjoy all year long!